Today is Iris’ birthday! Iris is the genius behind The Daily Dietribe, and a published author for whom I was fortunate enough to be a test baker. Iris held a birthday cake challenge this month. I had every intention of coming up with a birthday cake. But, you know what? I didn’t. In no small part because I don’t like cake. Cookies, on the other hand. We all know how I feel about cookies. 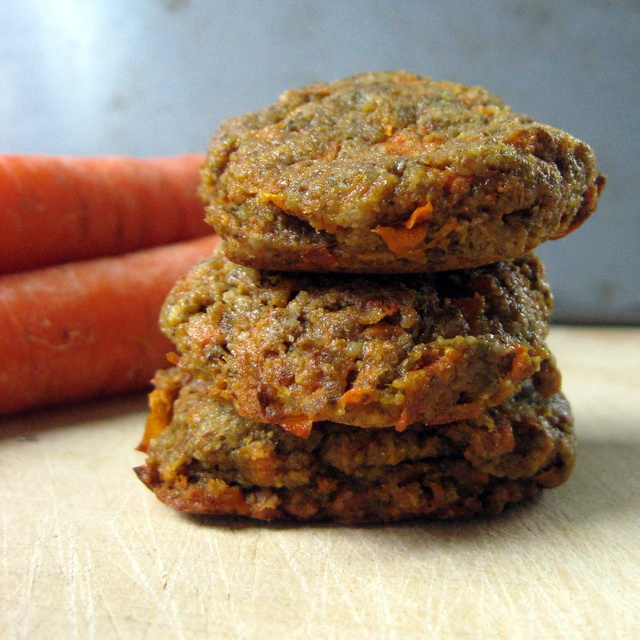 So, how about a carrot cake cookie? Will that do? Happy Birthday, Iris! Preheat oven to 350°. Mix all ingredients in a bowl with a spoon. It will be thick. Scoop out onto parchment-lined cookie sheets, flatten slightly, and bake until barely browned & firm – about 15 minutes. Note: Using chia “eggs” in this results in a very moist, almost pudding-like consistency. Using eggs results in a more cookie-like consistency. I like both. Your choice. Want to find more recipes that are allergy-free or super healthy? Check out allergy-free Wednesdays and Wellness Weekends! This entry was posted in carrots, cinnamon, cookies, desserts, grain-free, nightshade-free, nut-free, vegan and tagged cookies, grain-free, nut-free, recipes, vegan. Bookmark the permalink. Awesome! I definitely want to try these. Please report back if you do try them! I’m totally a cookies-over-cake person too. These sound deeeeelicious! Thanks! I hope you give em a try. Deanna, thank you so much! That’s so sweet! Once I find some time, I will go add these to my roundup (if you don’t mind)! I love cookies as much as cake! Of course I don’t mind. Hope you had a wonderful birthday! new to the world of gluten, egg and dairy free I have yet to come across mesquite flour. Is there something that I can subsutitute it with? The mesquite flour adds a sweet, sort of molasses like flavor. You could sub some almond flour and some sugar. It won’t taste the same, but the recipe should work. Or, even just some sugar. Or, try a tablespoon of molasses plus a tablespoon of tapioca or arrowroot starch. I’m guessing on all of these subs. But, I think it’s a fairly forgiving recipe, so have fun and play with it!